April | 2017 | Cooking is Fun … Really!! 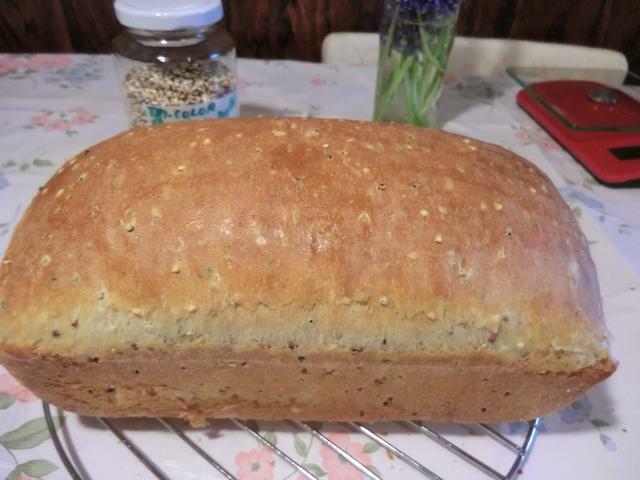 ETA: If you don’t have any starter, simply replace it with 1/2 cup of warm milk, about 1/3 cups more AP flour, 1 tsp of sugar and 2 1/4 tsp active dry yeast in the quinoa bread recipe below. 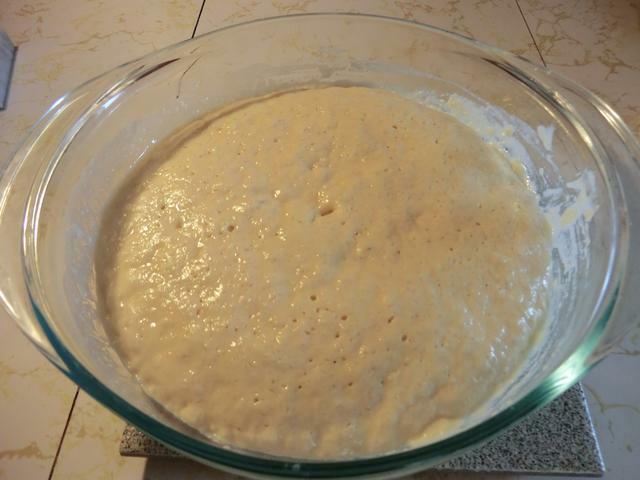 Proof the yeast with the warm milk into which the sugar has been dissolved and add it to the dough at the same point that you would have added the starter. 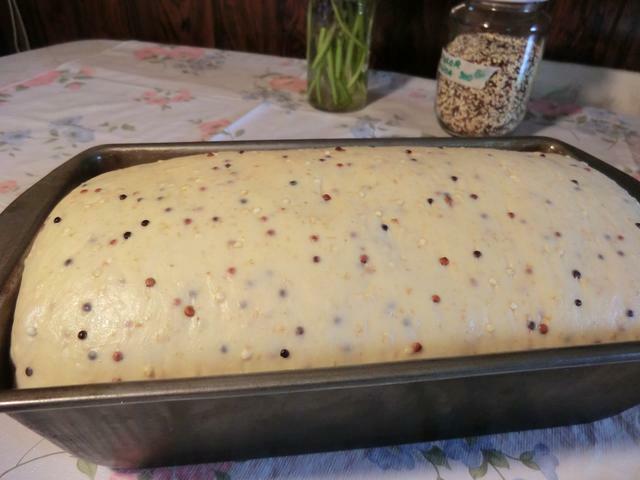 On a recent trip to Bulk Barn I picked up some tri-colour quinoa and riffing on my previous honey whole wheat sourdough bread experiments, I made a lovely sandwich loaf with some soaked quinoa. 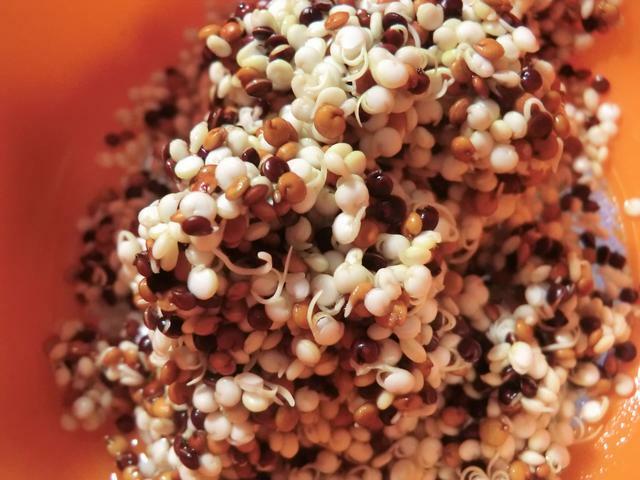 ** You may find that some of your quinoa has sprouted the next morning. 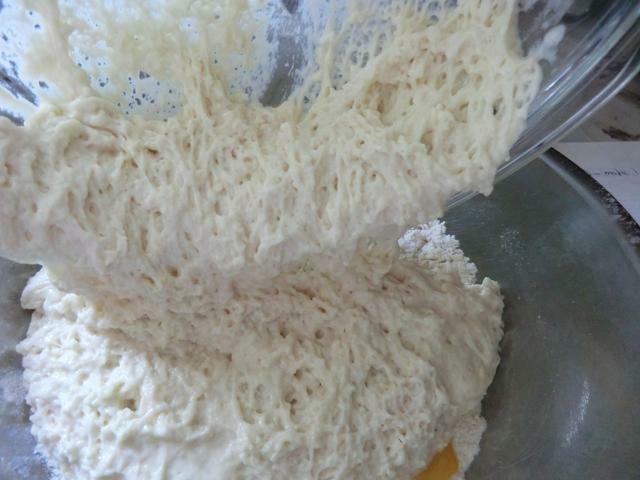 In a large bowl, combine 1 cup of the AP flour, the WW flour and the salt, stir well. 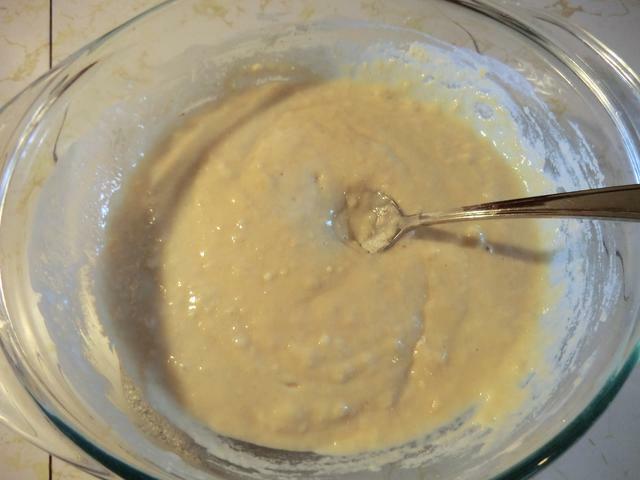 Add the quinoa, honey, olive oil, garlic powder (if used), starter, milk and egg and beat well with a large wooden spoon until you have a smooth batter. 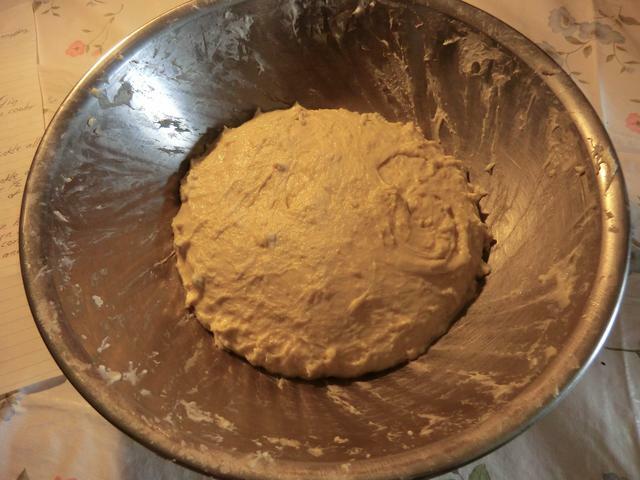 Gradually stir in the rest of the all purpose flour, 1/4 cup at a time, until the dough forms a ball around the spoon. 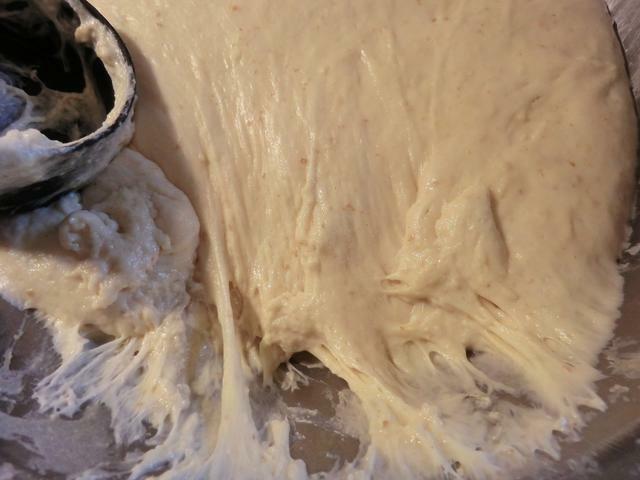 Turn out the dough onto a floured working surface and gradually knead in the rest of the flour until you have a soft but not sticky dough. 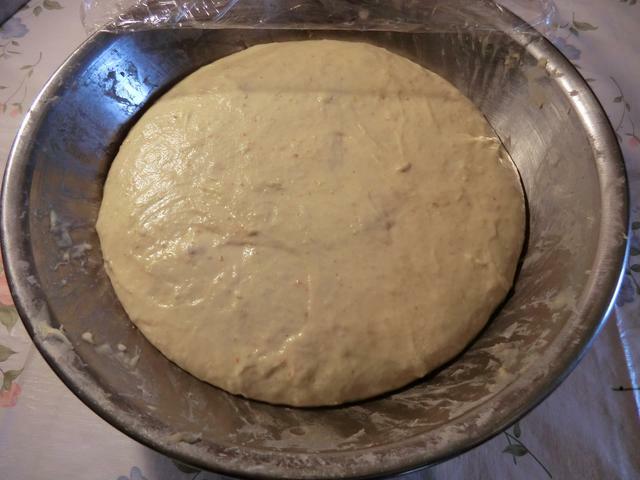 Knead for 5 minutes, let rest for 5 minutes under a bowl and then knead for another 5 minutes. 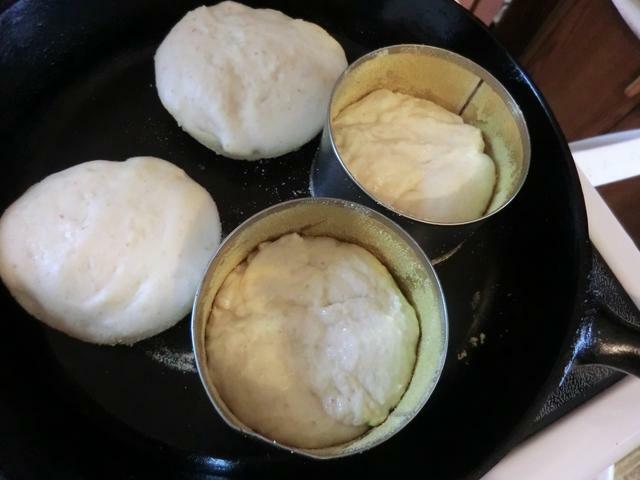 Shape the dough and place into an oiled 9 by 5 1/4 inch loaf pan. Cover again with saran wrap or the towel and let rise until doubled, another 1 1/2 – 2 hrs. 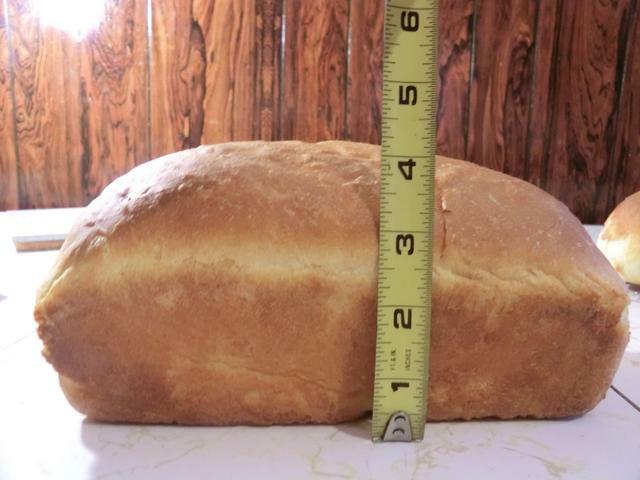 Preheat the oven to 375 deg F and bake the loaf for 25-30 minutes until well browned and the bottom is firm and sounds hollow when knocked. You may need to cover with a sheet of aluminum foil if it gets too brown before it’s finished baking. Turn out and let cool on rack. Don’t cut until it’s cooled to room temperature. 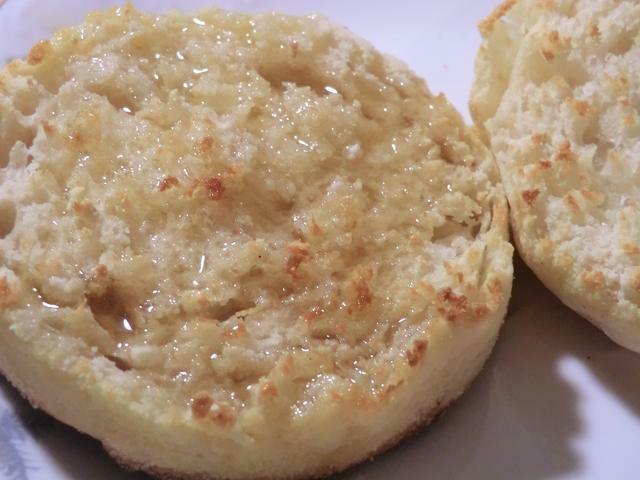 Recently, I had a craving for English muffins and this weekend I tried a new recipe I found on line, which used sourdough starter. It ended up being a bit fiddly to execute and the finished muffins were much bigger than I liked. I split and toasted the muffins and ate them with butter, honey and peanut butter. 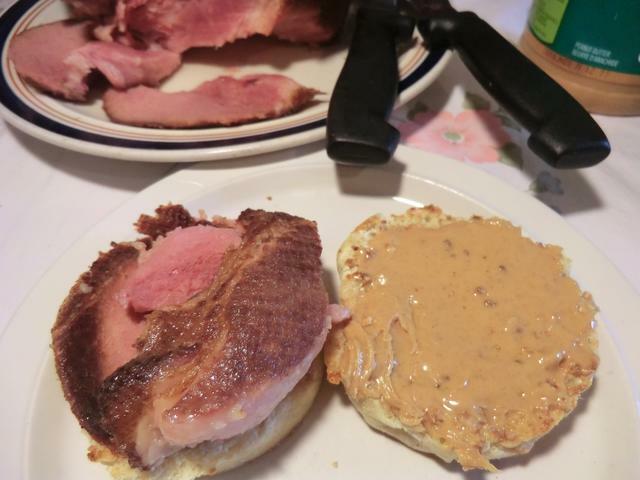 I even had a hearty ham and peanut butter sandwich. 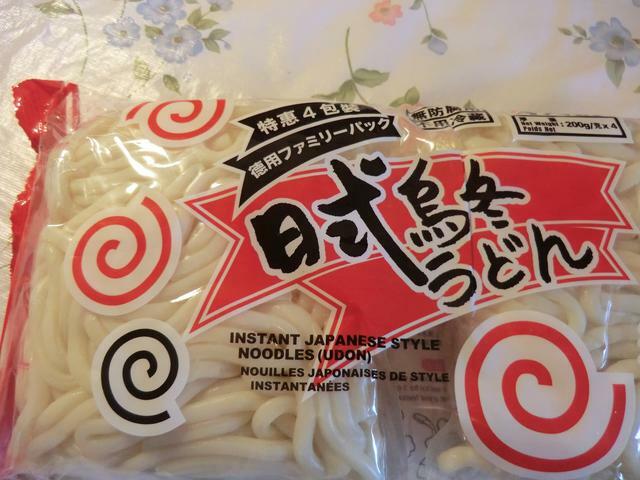 Tasty, but not remarkable. I had Friday off because of a PD day so I went out and ran a bunch of errands. I’m SO glad I did so cause it was nice and sunny and not very cold at all. I had lots of energy. 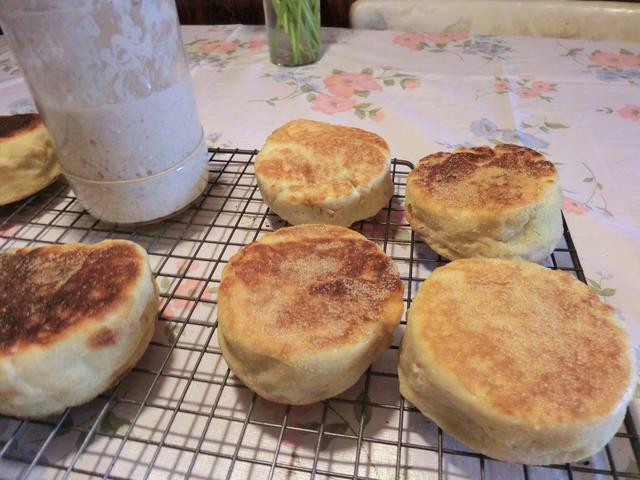 I even made a batch of sourdough English muffins using a new recipe when I got home. The results were ok but too fiddly to repeat so I’d stick with my previous version. Today is a gray and miserable day and I’m not in the mood to go out. So, I boiled up a smoked picnic shoulder ham. Which I sliced and made a sandwich with on a toasted English muffin, from yesterday’s bake, slathered with smooth peanut butter. That should tide me over for a while. 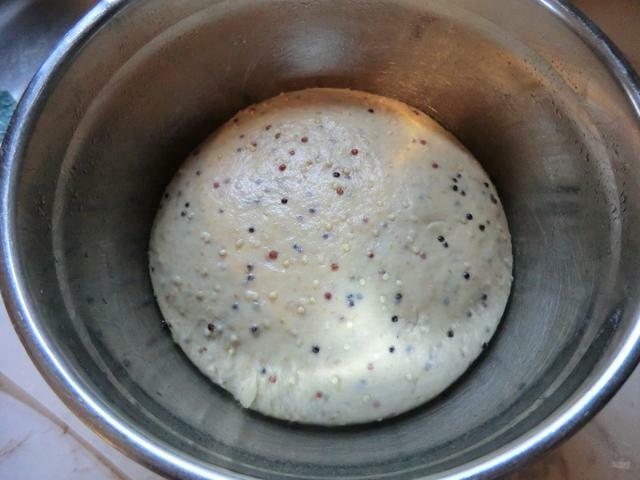 And I’m baking a quinoa honey whole wheat sourdough loaf. I may even post some pictures. Right now, I’m doing a load of laundry while my bread final proofs. I hope tomorrow is a much nicer day. 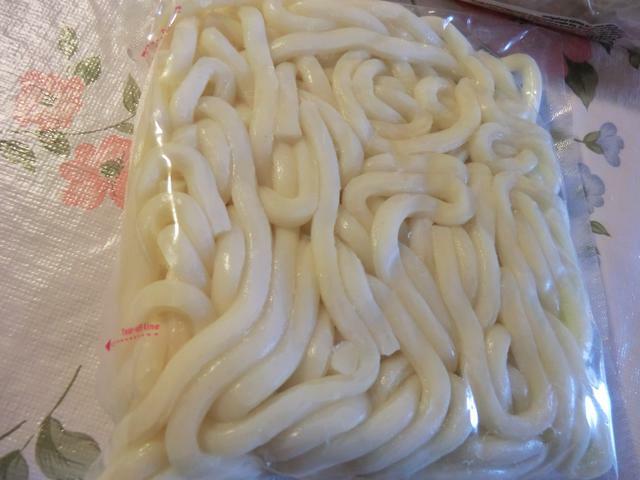 Noodles are ubiquitous in many cuisines and udon, a soft, thick and chewy wheat noodle, is one of the many Asian forms I hadn’t tried until I found them fresh at my local, cut-rate, grocery store. Vacuum sealed in individual portions, they’re removed from the package and added to a pot of boiling water where they take only three minutes to cook to the al dente stage. Rinsed thoroughly in cold water and then well drained, they can be served either hot or cold. 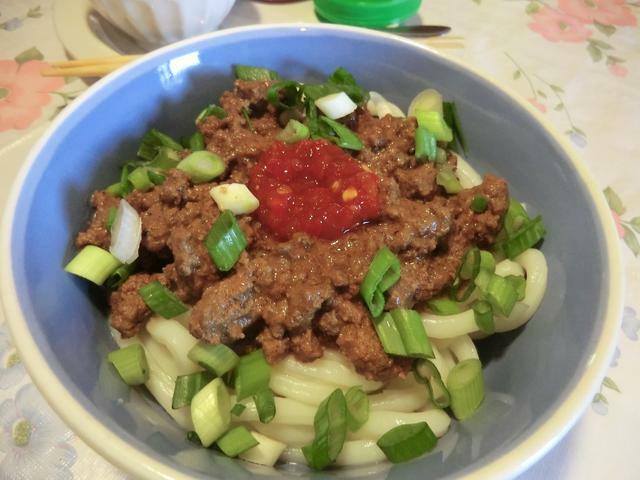 Dan Dan Noodles … the noodles are topped with the meat sauce, sambal oelek and green onions … stir it up and dig in. 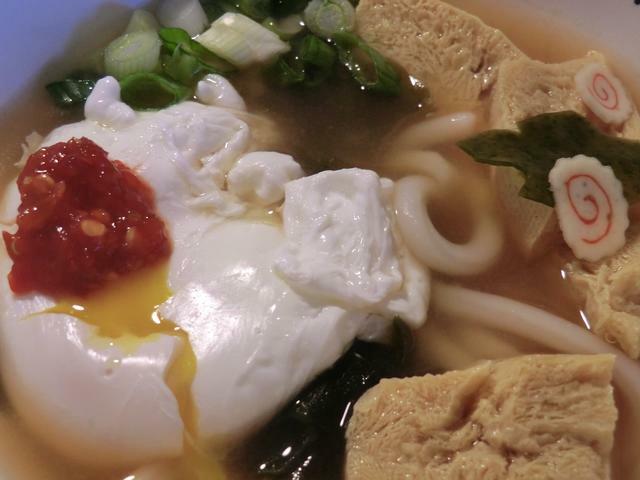 Tofu and red miso soup served over a half package of udon noodles with a poached egg for garnish. Sorry for the delay in posting … no real reason. I hope everyone had a wonderful Easter weekend with friends and family. Four days off seems like a lot but, amazingly, it’s Monday already and they flew by. 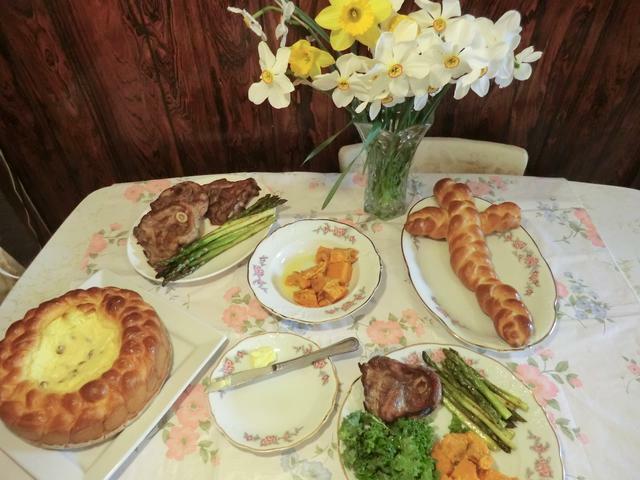 It was a mild weekend so I went outside and bbq’d a tray of lamb shoulder chops, a package of asparagus and a package of jumbo hot dogs for my Easter dinner. It was all delicious. 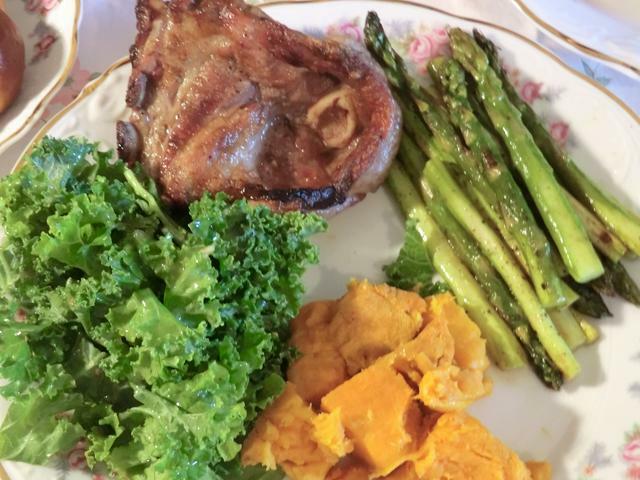 Supper – Chickpea soup with a crispy kale garnish and the lamb chops, kale salad, sweet potatoes and grilled asparagus. 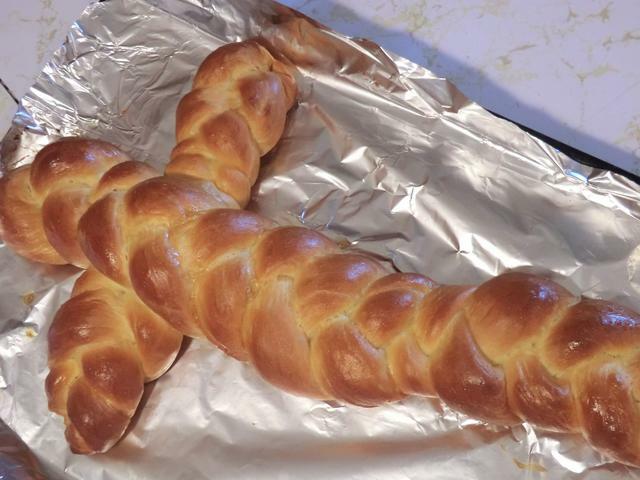 Instead of buns or rolls, I used part of the dough from the traditional Romanian Easter bread, pasca, which I posted already, to make a pull-apart braided cross. And here’s the star of the meal. The cheese filling is an accent not the main feature. 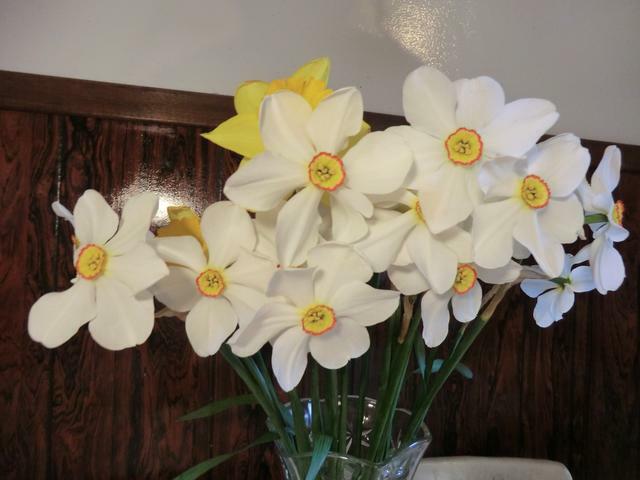 I cut some of the flowers from the front ‘garden’ for my Easter table and though the daffodils are all faded (they were gorgeous last weekend) the narcissus are beautiful, as always. My dad’s plantings are doing him proud yet again. And speaking of plants, I planted a small egg tray (2 seeds in each of 6 cups) of lavender seeds a couple of weeks ago but there’s no sign of any seedlings yet. I’m not quite sure why I decided to plan them, but I have had this package of seeds for a while so I thought I’d give it another try in the face of previous fails. UPDATE (04/22) : only 1 seedling germinated. It was never a very successful package of seeds so I suspect there was something wrong from the source. I’m debating on what else I should plant this year from my collection of seed packets. Mostly herbs since that’s mostly what I have. Basil (Italian and Thai), some shiso since none of the four or so lovely plants I had in the house over-wintered successfully indoors, from the fall planting. One leaf after another dropped off until all I was left with was a bare stalk with faded blossoms on it. I suppose I could have gathered the seeds but I didn’t plan ahead. As to the mitsuba, I have one very leafy plant sitting on the window sill in the entry way. 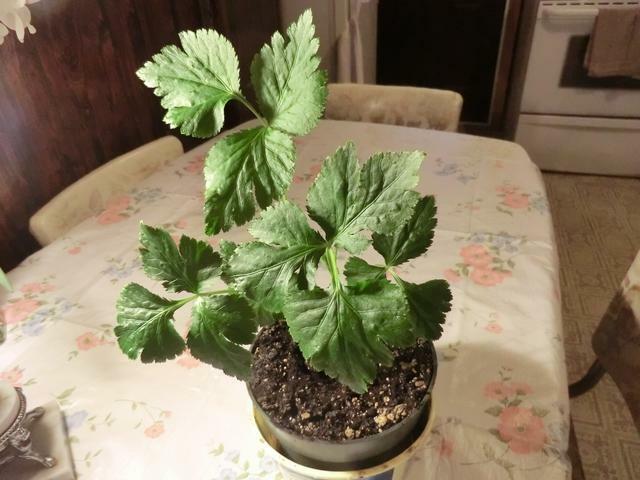 I pinched off the older faded leaves as a new furl appeared in the center and now I have huge leaves on it. The pot isn’t very large or deep but I’m wary of transplanting in case the shock causes them all to drop off. It seems like the sage plant I bought from the city market has overwintered successfully outside without any type of covering but the rosemary … I’m pretty sure it’s dead. Thyme, oregano and mint plants were also in the pots but it’s too soon to tell if they’re going to come back. 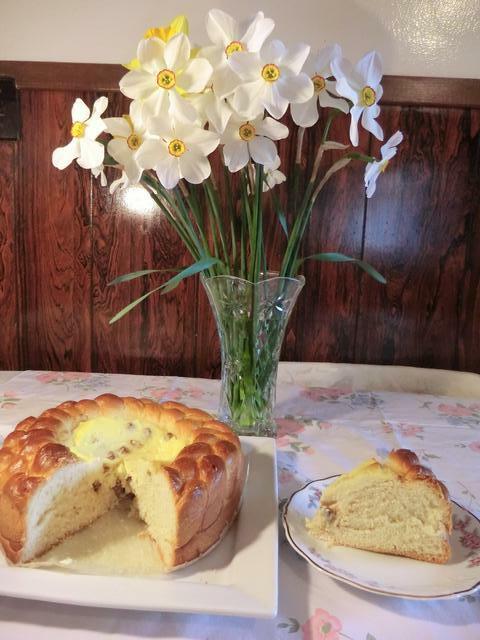 There are several kinds of Easter bread or preparations called variously, pasca or pascha or paska. One is even a molded type of cheese. 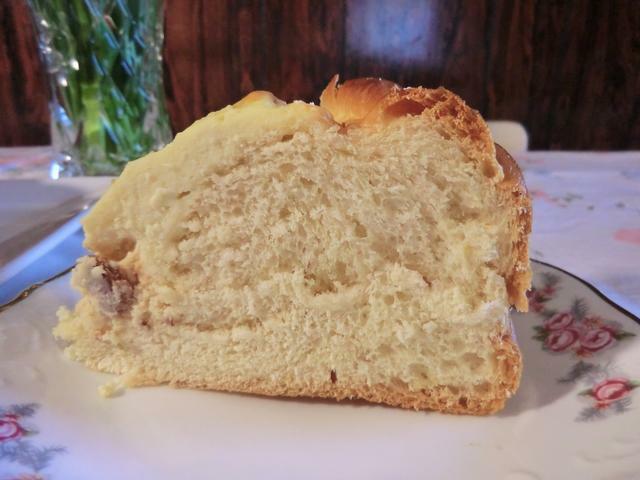 But this version, made with the same sweet yeast dough as cozonac, has a sweetened cheesecake filling. 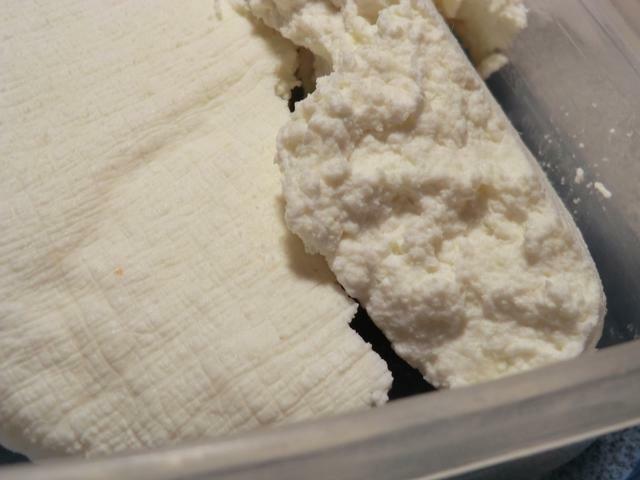 The cheese used is a dry curd cheese, though ricotta, drained cottage cheese or even cream cheese has been used in recipes I’ve seen on line. 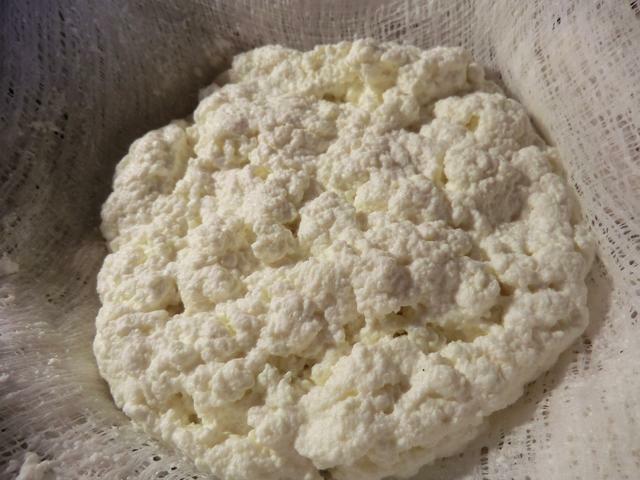 I had a bit of cottage cheese in the fridge but not enough for the recipe I wanted to try so I made a batch of paneer (cheese made from acid curdled milk) which I drained well and used instead. 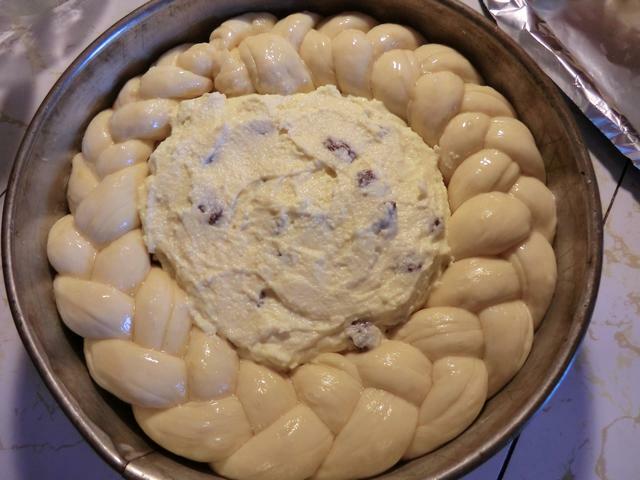 I wanted a higher cheese to bread ratio so I only used 1 1/2 pounds of dough (instead of the full two pounds the dough recipe makes) for the pasca. 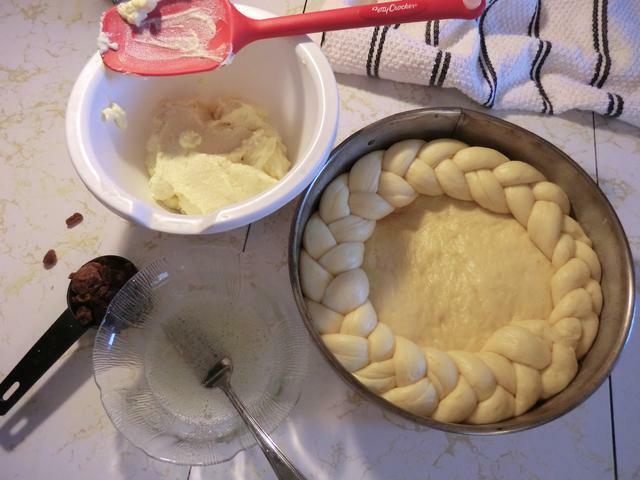 Dough shaped into base and braided border – next time I have to press down the center area where the cheese is spooned in. 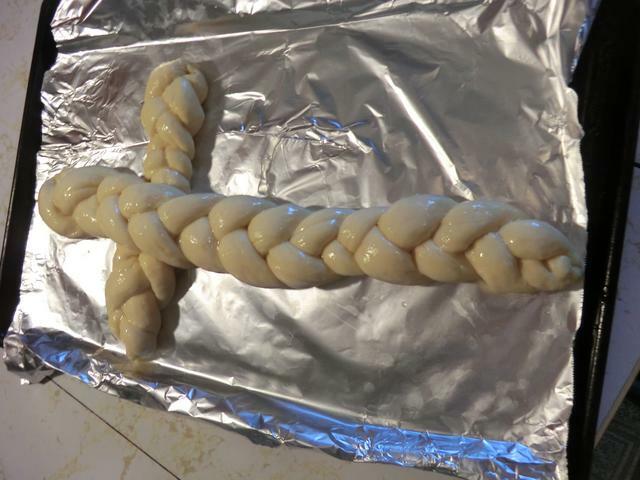 I made a braided bread cross with the remaining dough. 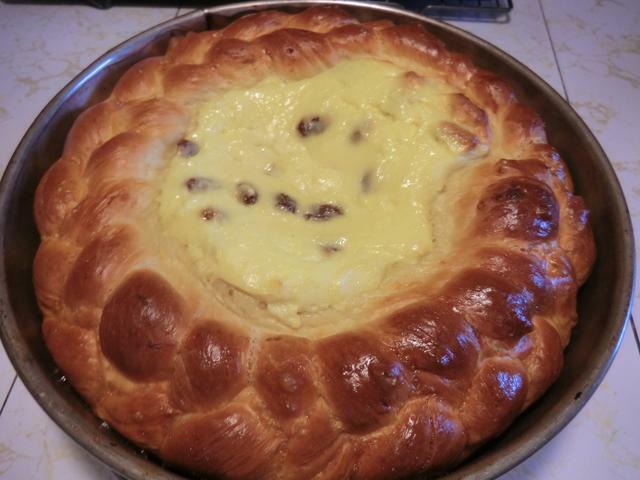 In Romania and other countries where the pasca is made, it has deeper religious meaning, but it’s also a very tasty bread enjoyed at this time of the year. A change up from the endless bread posts. 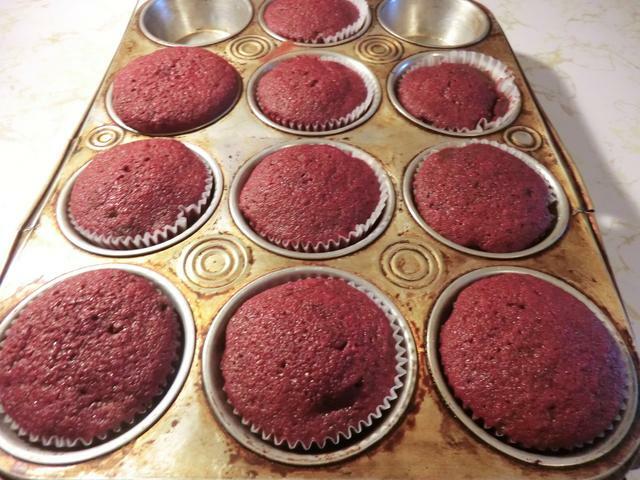 I tried out a recipe for red velvet cake for the first time by making a half batch and baking cupcakes. 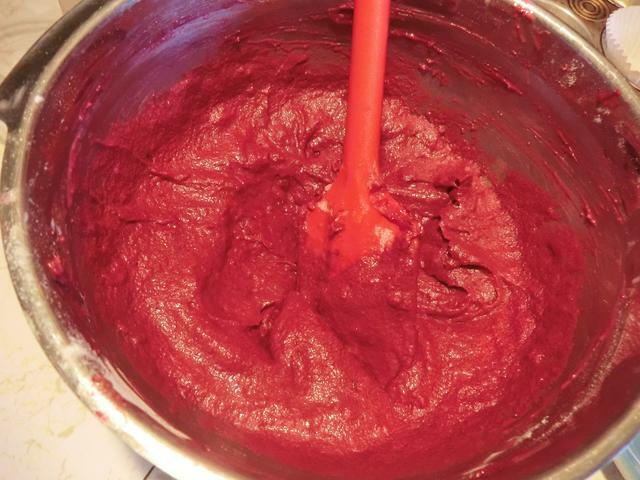 Next time … do NOT double the cocoa cause the liquid red food colouring ended up sort of garnet instead of the ‘red’ that the person who posted/rec’d the recipe had. Since the cupcakes went into the freezer, I didn’t make a frosting but the cream cheese/butter combo is probably warranted. 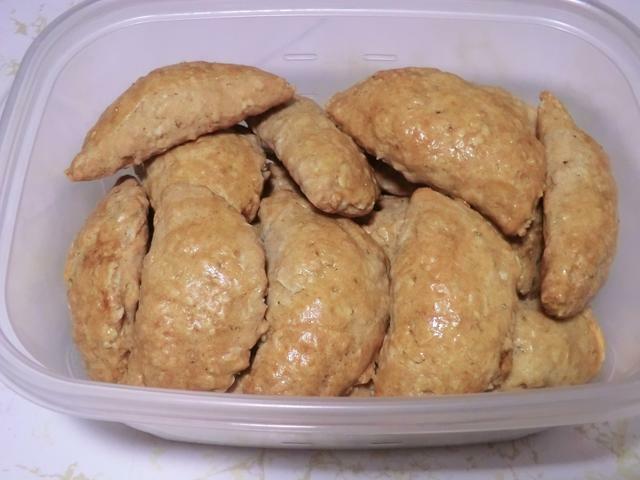 And I made a batch of date oatmeal turnovers using a tried and true recipe. I made a few changes to switch things up like NOT pulsing the oatmeal flakes a bit in the food processor, which was a mistake. There’s a bit too much texture/roughage for my taste. And, I decided to try the egg glaze to see if I liked the shiny look … meh!! (I don’t think the look is worth using up a perfectly good egg especially as I ended up throwing away the rest.) 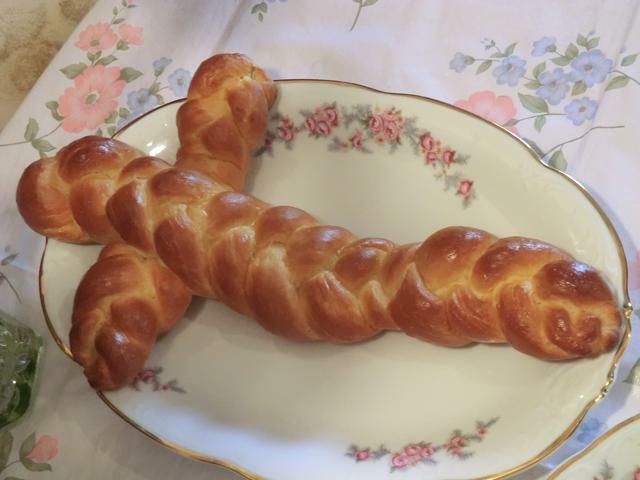 For serving, I’d make up an icing sugar/butter glaze and drizzle it over the turnovers. 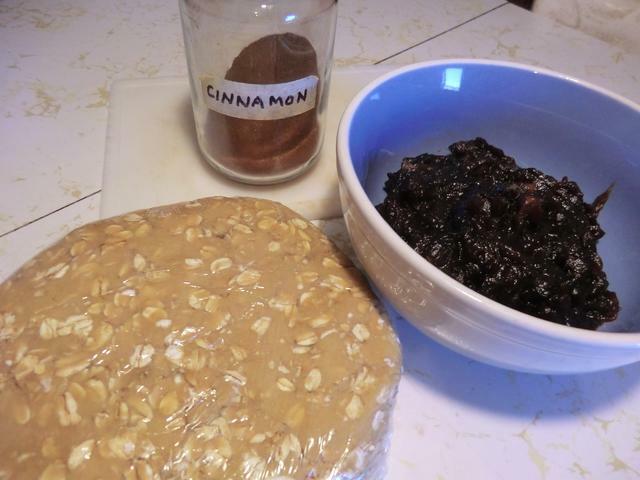 ETA (04/12/2017): I decided to add the recipe in case anyone is interested. In a small bowl, add the gelatine and sprinkle the water over the top. Allow to bloom. 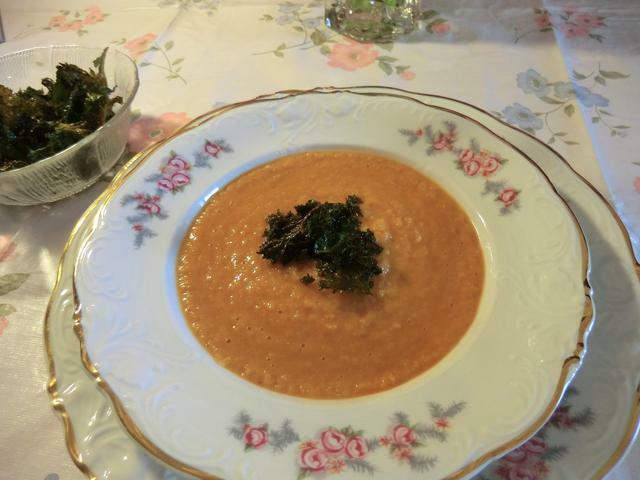 Scald the cream in a saucepan on the stove, or in a microwave safe bowl, and stir (or whisk) in the sugar and salt. 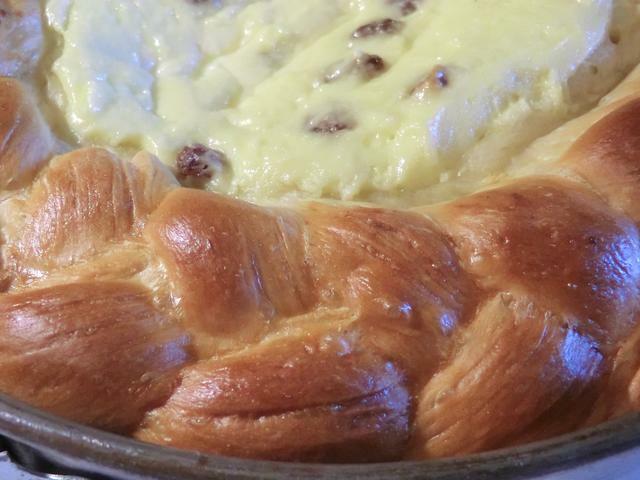 Add a bit of the warmed cream to the gelatine mixture and stir until the gelatine is dissolved. 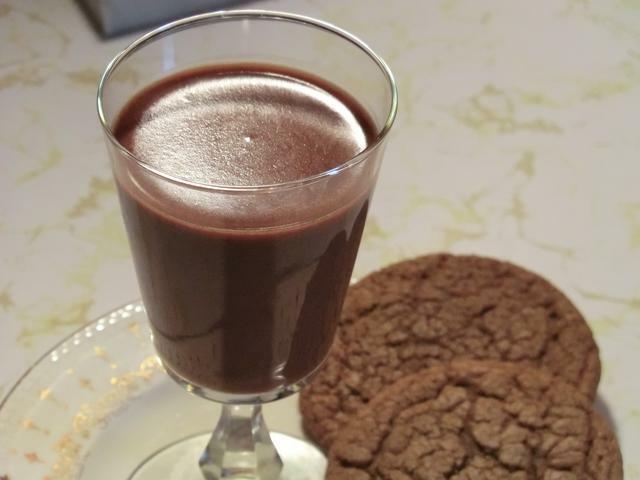 Stir the Nutella into the warm cream until it’s thoroughly dissolved. Add the gelatine mixture and stir. Pour the mixture through a sieve into a measuring cup. 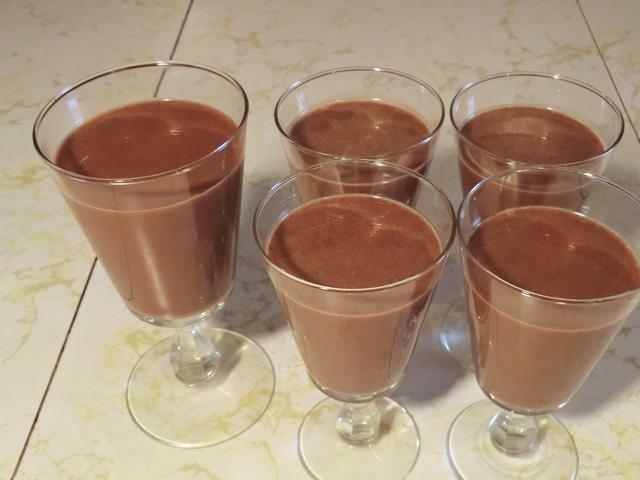 Portion the panna cotta mixture evenly into 4-6 containers. Let set in the fridge for at least 2 hrs. Four is preferable if you can wait that long. 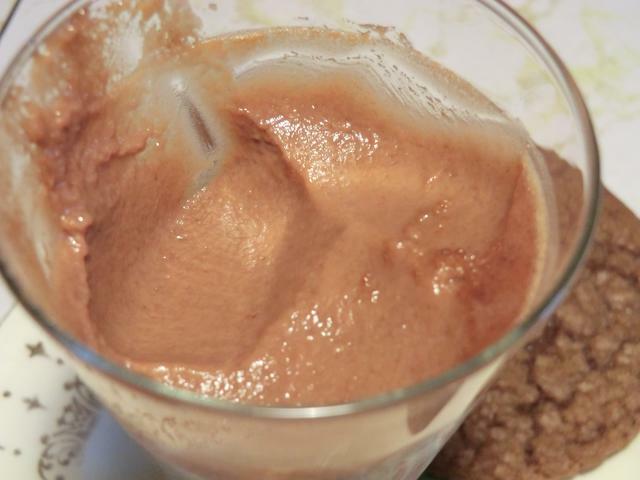 There’s no need to turn out the panna cotta. Eating it out of a pretty glass or other serving dish is fine. 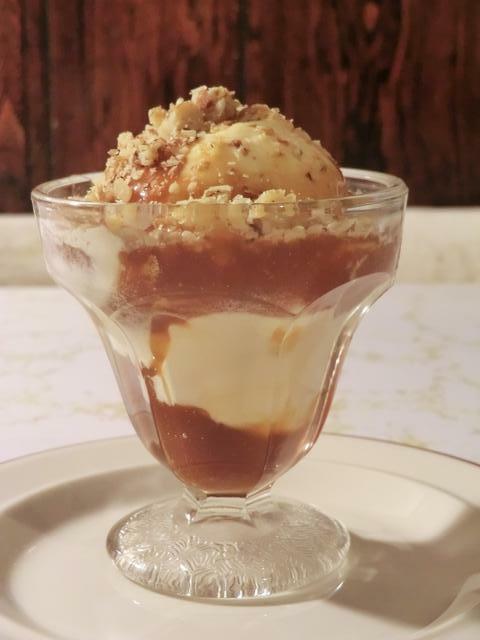 .. and a quick sundae with the last of the French vanilla ice cream in my freezer and some sea salt caramel sauce. If you buy flavoured sparkling water or those flavour crystal packets, this alternative is cheaper and probably healthier. 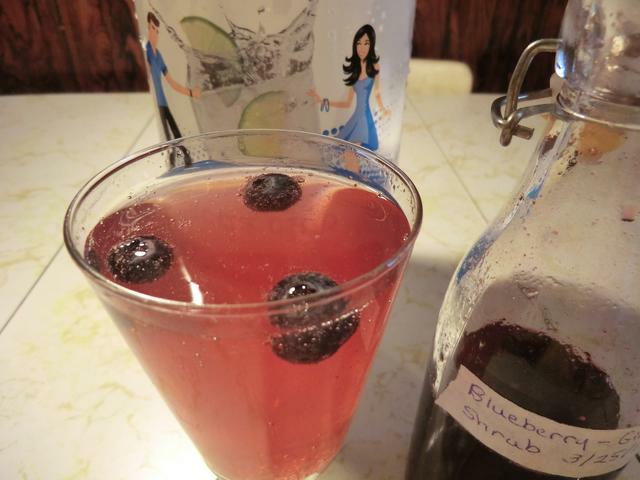 “Shrubs” are fruit and/or herb and spice sugar syrups with a vinegar base. 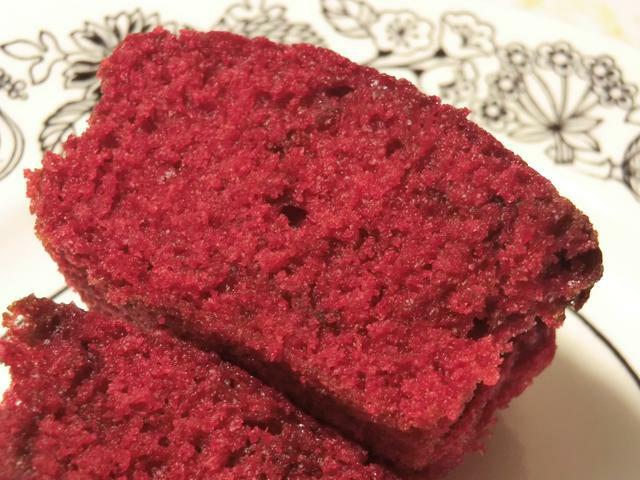 A simple 1:1:1 ratio of the fruit, sugar and vinegar is used. In the ‘cold method’ the cleaned and diced fruit is macerated with sugar, strained and then the syrup is mixed with the vinegar. In the ‘hot method’, vinegar is brought just to or under the boiling point, before it’s poured over the fruit and allowed to macerate overnight or up to several days. 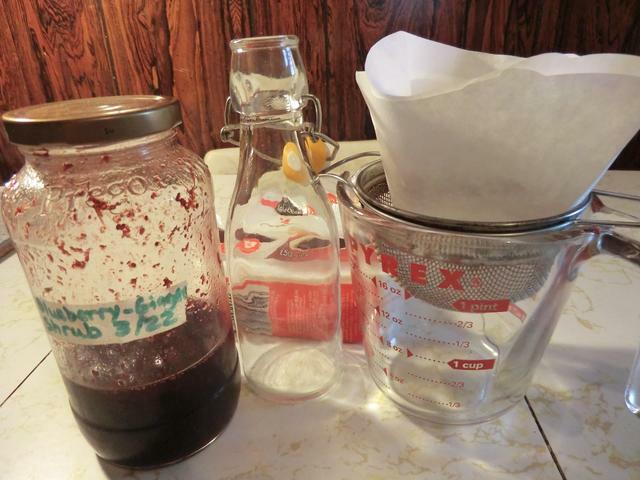 Then, the fruit is strained and the liquid is mixed with sugar. In both cases, the resulting liquid is stored in sterilized bottles under refrigeration. I used an alternative to the cold method which I found posted here. In a large jar, combine blueberries and sugar and macerate with a muddler or the handle of a wooden spoon. Pour the vinegar over fruit and grate the ginger on top. 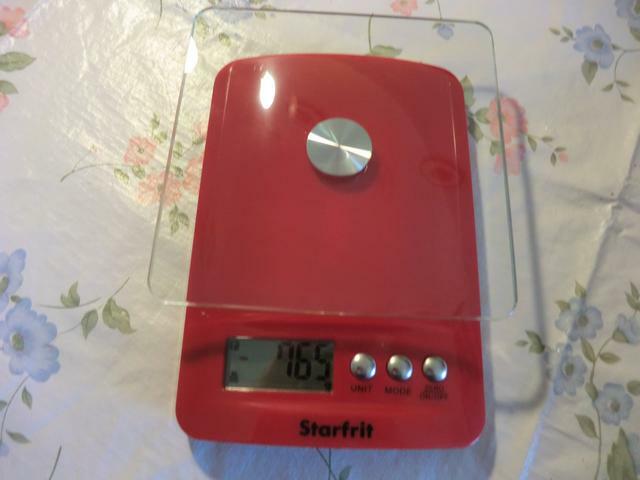 Stir, cover with a lid and place into the fridge for 2-3 days until all sugar is dissolved. 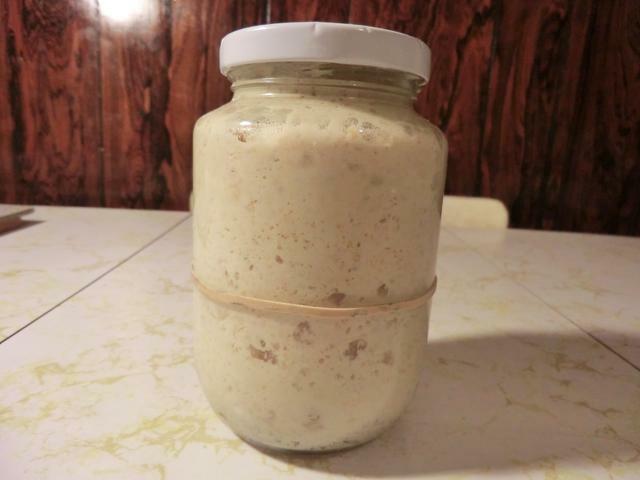 Place the sieved liquid into a fresh, sterilized jar and return to the fridge. 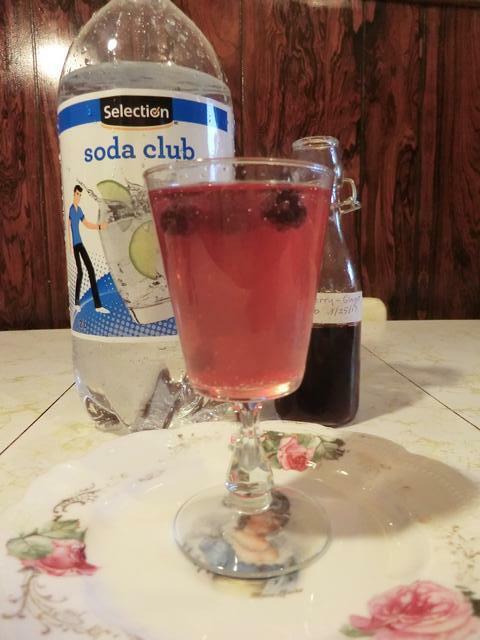 To serve, mix 1 tablespoon of the shrub syrup into a glass of still or sparkling water. Taste and add more syrup, if desired. Shrub syrups may also be used as cocktail mixers, in salad dressings, and more. ** According to on line sources (uncredited): Any vinegar may be used, as long as it is labeled as having at least 5 % acidity. Distilled white vinegar has a clear, sharp flavour but may be too acrid for most people’s tastes; apple cider vinegar tends to be milder with a fruity flavour; and wine/champagne vinegars, while more expensive, often provide a superior smooth flavor. Balsamic vinegar is delicious with cherries and strawberries. 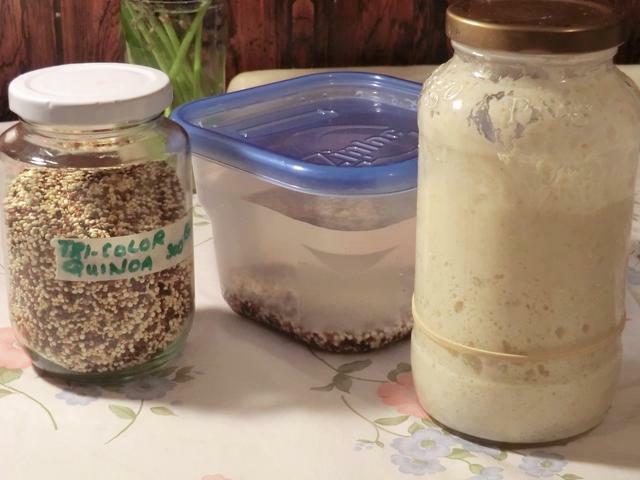 An early pair of experiments in which I transformed a yeast mini loaf recipe into one with JUST sourdough was a success so I repeated it here, in reverse, starting with yeast and sourdough (SD) starter and gradually reducing the amount of yeast used. 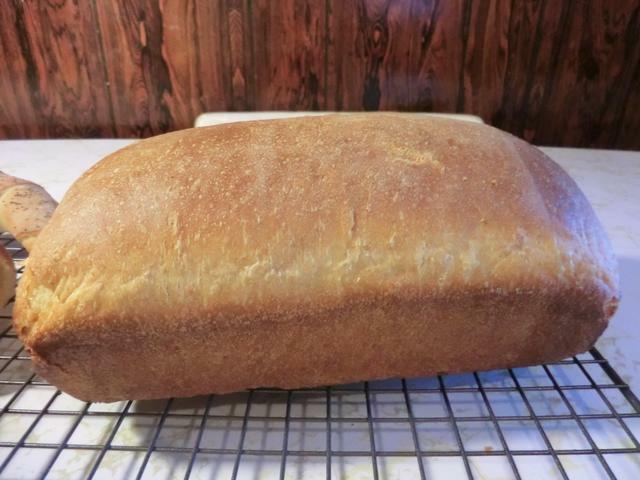 I baked the bread in an actual loaf pan … something I rarely do … just because I’m bored and this will at least make me feel like I did SOMETHING productive. 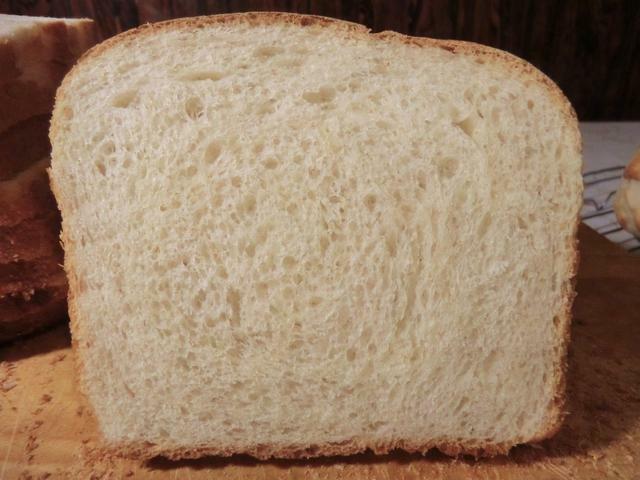 The bread was pretty good too, though next time, I’m only going to use whole wheat in the starter, as I’m not very fond of the taste in the finished loaf. 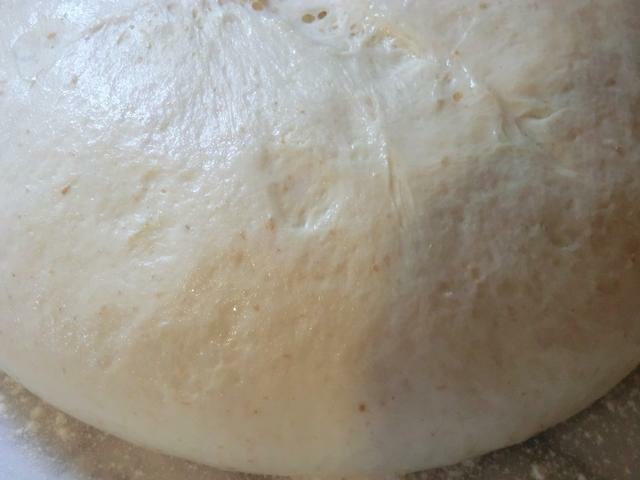 Nice bubbly starter fed with all purpose and whole wheat results in a ‘poofy’ dough after bulk proofing. Don’t you just love the technical jargon of bread baking? 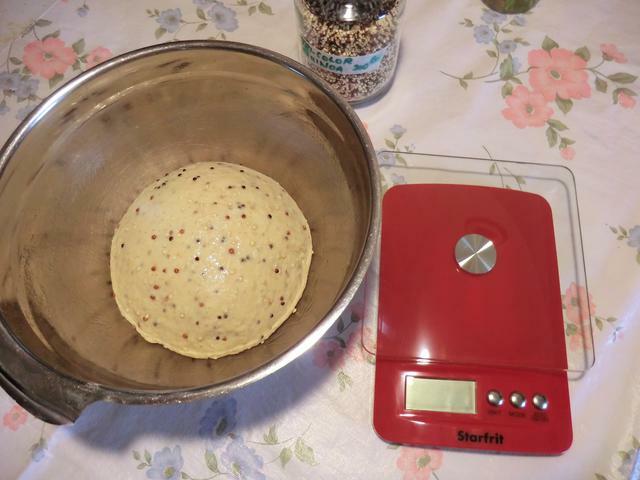 Experiment 1 – 2 tsp of dry yeast and <1 cup of SD starter, mostly all purpose (AP) flour but with some whole wheat (WW), 2 lbs of dough all baked in one 9×5″ loaf pan, at 375 deg F.
Experiment 2 – 1 tsp of dry yeast and <1 cup of SD starter, as above, 1 1/2 lbs of dough baked in loaf pan and the other 1/2 lbs of dough were baked in a smaller disposable aluminum foil pan. 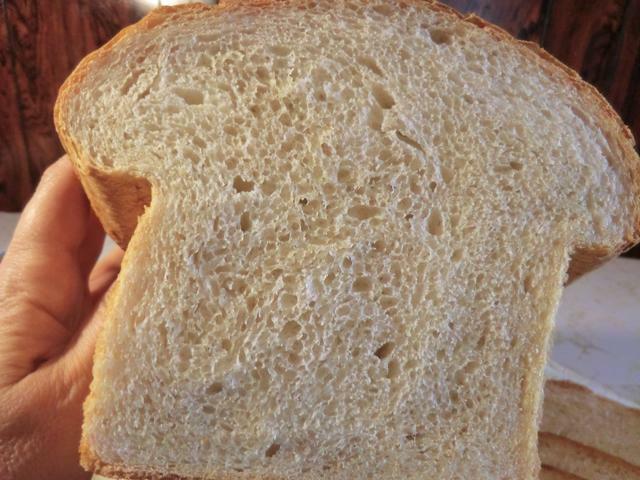 The resulting mini loaf was quickly sliced and devoured … for quality assurance, you understand. 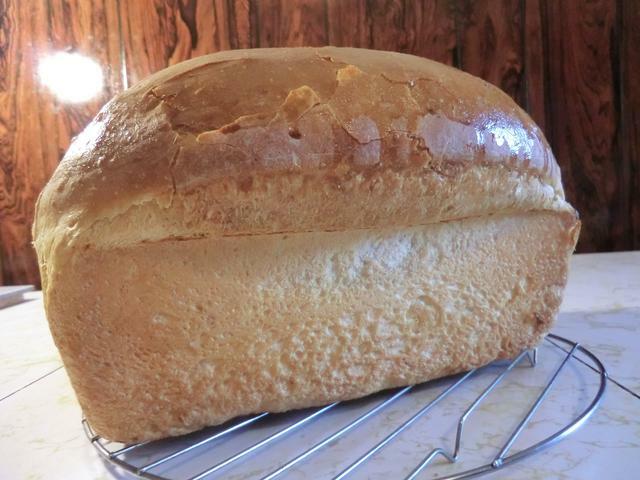 Using only 1 1/2 lbs of dough in my pan gave me a much nicer final loaf shape after baking. I proofed the loaf a bit longer as I had reduced the yeast to 1 tsp, rather than 2 tsp, while still keeping the same amount of starter. 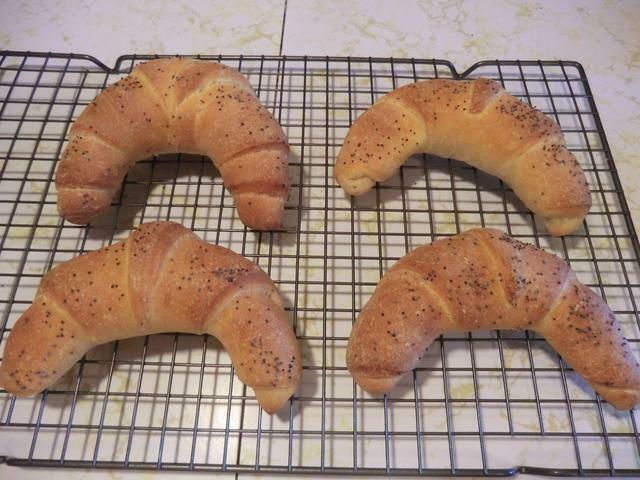 Experiment 3 – NO YEAST, only <1 cup SD starter, as above, 1 1/2 lb of dough baked in loaf pan, rest of the dough (>1/2 lbs) shaped into crescent rolls. 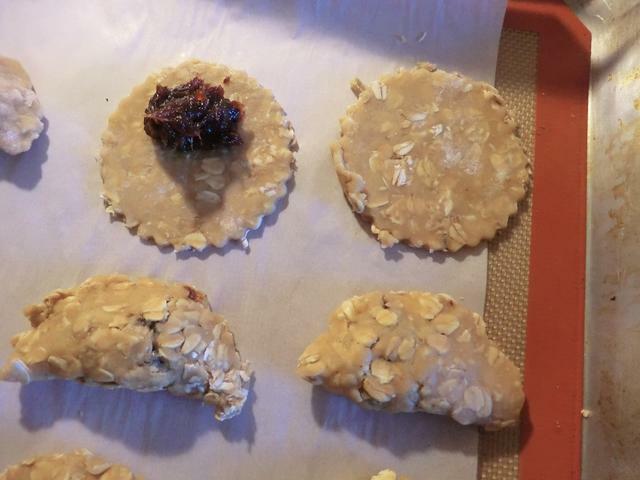 I used 1 cup of WW flour to ~ 2 1/4 cups of AP flour in this final trial. 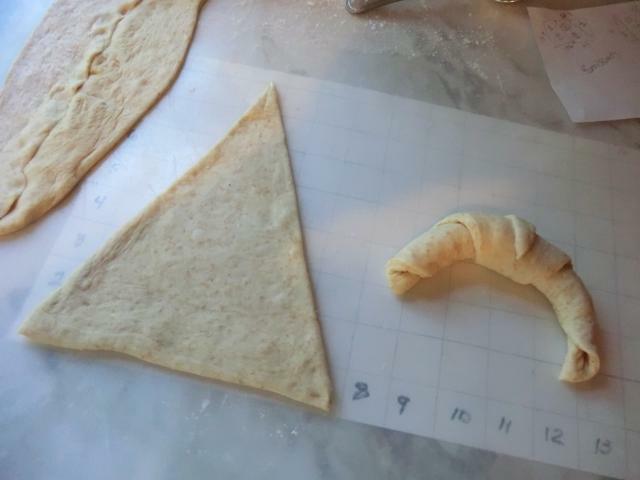 Shaping the crescent rolls – > 1/2 lbs dough rolled out into an 8 x 14 inch rectangle. 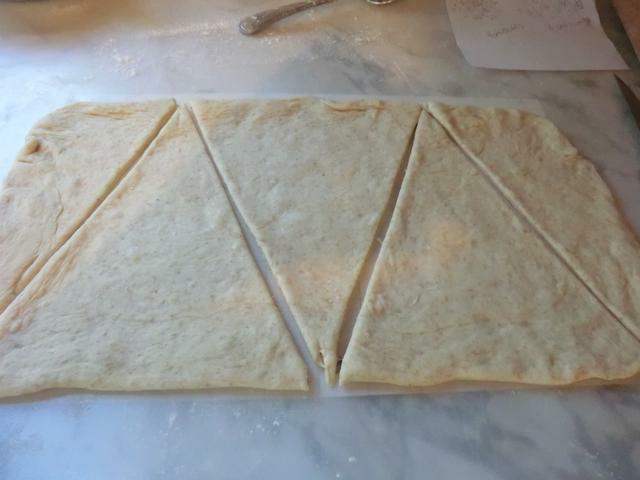 Triangles had a base of 7 inches resulting in 3 perfect triangles and a 4th triangle pieced together out of the two end halves. 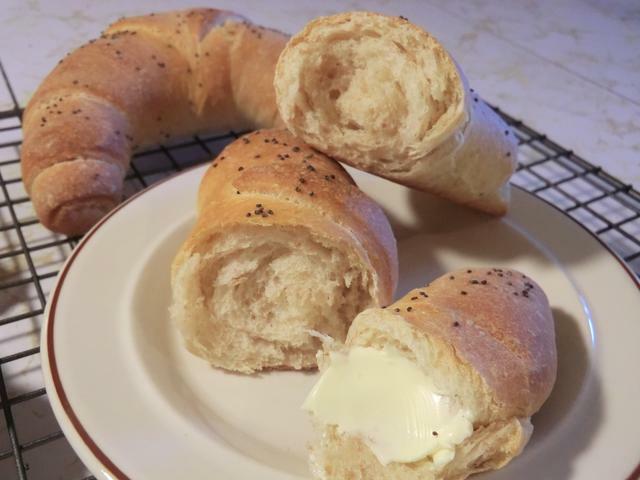 PS: Gave away the loaves from Experiment 2 and 3, as well as the 3 crescent rolls, so I only have the brioche buns I made a while back and some of the bread from Experiment 1 left in the freezer. 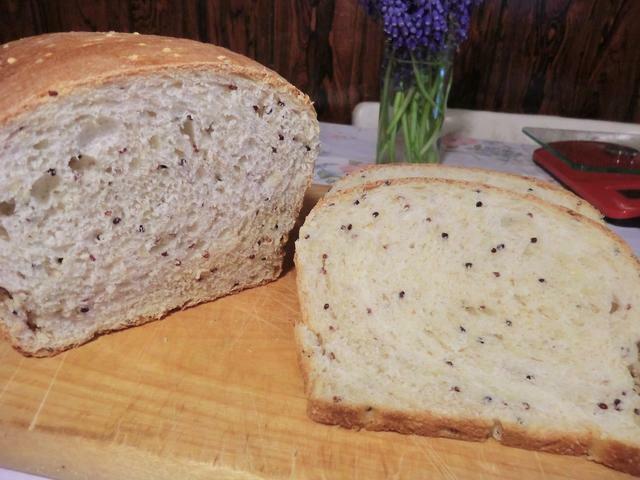 I may write up the recipe of a basic version of this loaf but it’s pretty repetitive of previous ones I’ve posted.